Probably the most legendary and famous engine in the world. 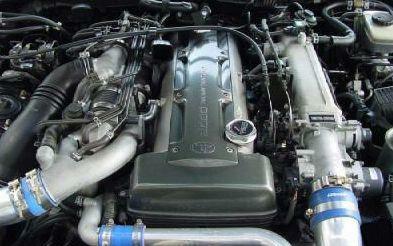 2JZ engines were produced since 1997. Displacement of all modifications were 3 liters (2997 cu. cm). It was the most powerful engine in JZ series. Bore and stroke of the engine forms a square and are 86 mm. It has DOHC with two camshafts and four valves per cylinder. Since 1997, the engines were equipped with a VVT-i system. Comparing this engine with 1JZ we can say that 2JZ is bigger, but the head of cylinder block is pretty the same. But due to it’s capacity and torque 2JZ can spin turbocharger much earlier. 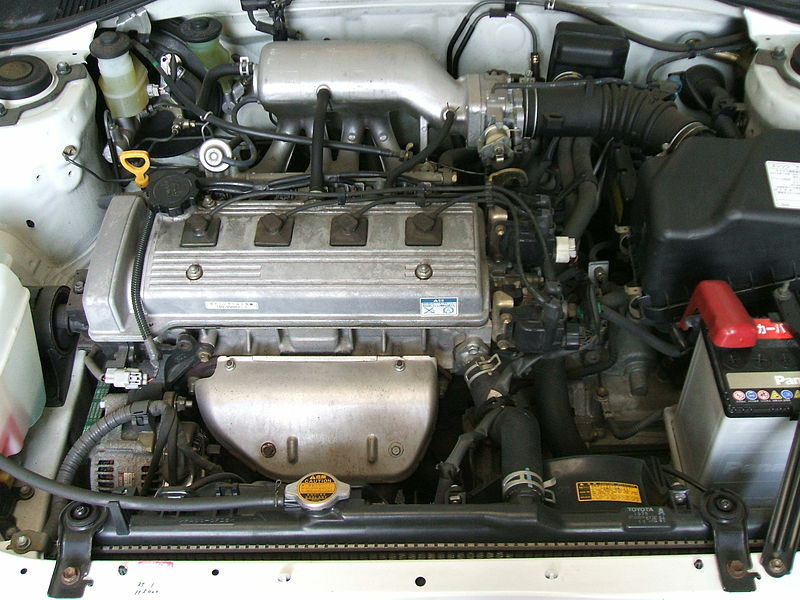 The 2JZ-GE is a common version. Output is 215–230 PS (158–169 kW; 212–227 bhp) at 5800 to 6000 rpm and 209–220 lb·ft (283–298 N·m) of torque at 3800 to 4800 rpm. It uses Sequential Electronic Fuel Injection, has an aluminum head and 4 valves per cylinder with some versions using VVT-i, along with a cast-iron cylinder block. The VVT-i version also featured DIS in favor of the traditional distributor set-up previously seen on the 2JZ-GE. Despite common misconception it was not a true COP (Coil-On-Plug, also known as Plug-top coil) ignition system instead relying on one coil to fire two cylinders, one of which was by spark plug wire. The 2JZ-GTE is an inline-layout, six-cylinder, belt-driven dual-overhead camshaft, air-intercooled, twin-turbocharged,cast-iron block, aluminium cylinder headed engine designed and manufactured by Toyota Motor Corporation that was produced from 1991 until 2002 in Japan. Development and evolution of the engine was, principally, a response to Nissan’s relatively new and then-successful RB26DETT engine which had achieved palpable success inFIA Group A and Group N touring car championships. The 2JZ-GTE originally powered the Toyota Aristo V (JZS147) in 1991 before becoming Toyota’s flagship performance engine in the Toyota Supra RZ (JZA80). 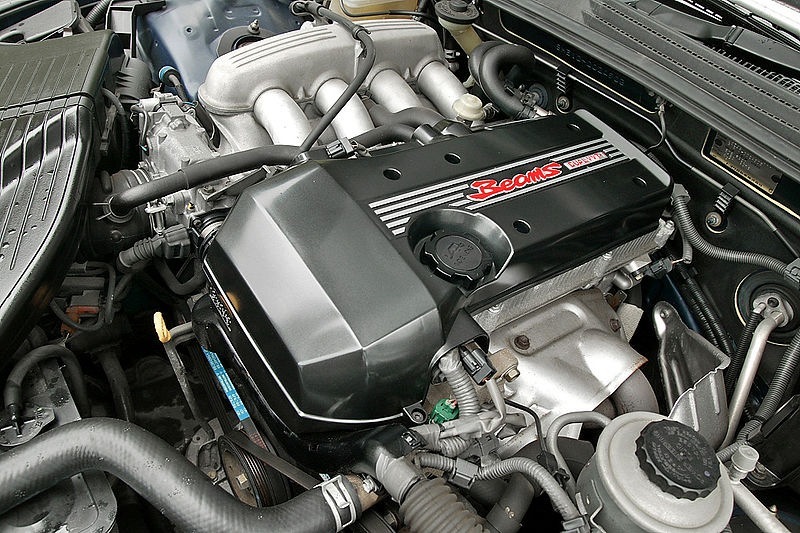 Its mechanical basis was the existing 2JZ-GE, but differed in its use of sequential twin turbochargers and an air-to-air side-mounted intercooler. The engine block, crankshaft, and connecting rods of the Supra’s 2JZ-GE and 2JZ-GTE are the same, with notable differences being that the2JZ-GTE has recessed piston tops (giving a lower compression ratio), oil spray nozzles to aid in cooling the pistons and a different head (redesigned inlet/exhaust ports, cams and valves). However, other 2JZ-GE equipped models (Aristo, Altezza, Mark II) share a different part number for connecting rods. 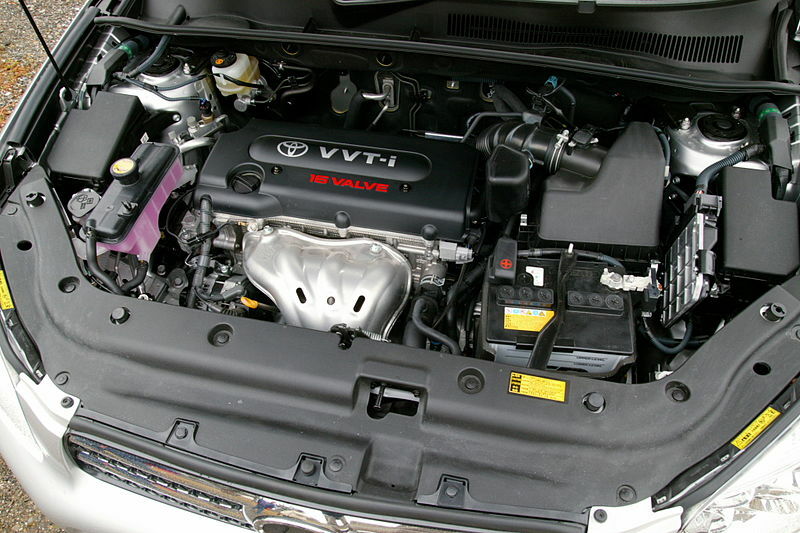 Toyota’s VVT-ivariable valve timing technology was added to the engine beginning in September 1997, hence it phased out the original engine. Consequently, maximum torque and horsepower was raised for engines selling in all markets. The addition of twin turbochargers, jointly developed by Toyota with Hitachi, in sequential configuration had raised its commercially cited output from 230 PS (169 kW; 227 hp) to the contemporary industry maximum of 280 PS (206 kW; 276 hp) at 5600 rpm. In its first appearance, torque was advertised as 44.3 kgm (435Nm, 320 lbft) at 4000 rpm to be later recited as 46.0 kgm (451 Nm, 333 lbft) with the introduction VVT-i in production year 1997. The mutually agreed, industry-wide output ceiling was enforced by Japan’s now-defunct Gentlemen’s Agreement exclusively between Japanese automakers selling to the Japanese domestic market. Engine power in the North American and European markets, as documented by Toyota, was increased to 325 PS (239 kW; 321 hp) at 5600 rpm. The export version of the 2JZ-GTE achieved its higher power output with the use of newer stainless steel turbochargers (ceramic for Japanese models), revised camshafts, and larger injectors (550 cc/min for export, 440 cc/min for Japanese). The mechanical similarities between the Japanese-specification CT20 turbine and export-specification CT12B turbine allow interchangeability of the exhaust-side propeller shaft. Additionally, the export-exclusive CT12B turbine received more durable turbine housings and stainless steel turbine and impeller fins. Multiple variants of the Japanese CT20 turbine exist discretely, which are identified with the B,R, and A part number suffixes (e.g. : CT20A). The 3-litre 2JZ-FSE uses the same direct injection principle as the smaller 1JZ-FSE but runs an even higher 11.3:1 compression ratio. This engine matches the conventional VVT-i 2JZ-GE with 162 kW (217 hp) and 294 Nm (216 ft lbs). The 2JZ-FSE is always used with an automatic transmission. 2JZ is pretty reliable and safe. But, nowadays most of these engines are in bad conditions, mostly because of the wrong exploitation. More info about general problems you can find at our 1JZ page, because all of them are similar. Before reading! You should know there is another way of tuning. You can find it in 1JZ page. Experience shows that with 2.5-3 liter engines tuners ideally obtain 500-550 hp. Therefore 500 hp on JZ – it is our dreamed “city car”. An ideal way is to go and buy a new kit for 5000$ or more. Not so cheap, but everything is provided. IMO is that HKS GT-SS kit is the best for a road car with 500 hp JZ. Two turbines of HKS GT-SS blow around 560-580 hp together and their engineering is so laid out that the promotion is truly fantastic! After graduating with a choice of turbo-kits, it’s time to pay attention to the injectors. Stock jets for 1JZ (380ss) can fit to 380-390 hp respectively, 2JZ (430ss) to 430-440 hp. My advice: take jets with a small margin. If you plan to go for 500 hp, and then better to have 500-550ss, but I would advise taking 620ss. If you plan to use a high-octane gasoline at the races and periodically raise the power, the 720ss is your choice. It can be used as HKS, Sard, and Dolphin. Often American tuners leave stock rail and they can copes. It happens that tuners leave a stock fuel regulator. But solutions from the HKS is perfect. Among regulators we can advise Aeromotive. Fuel hoses. Native hoses can keep this load without any doubt. But. The lower section of hoses and pipes is, the more difficult for them to pump and fuel system heats more etc. All this brings the detonation and affects on the durability of the whole system. If you have time and desire, of course, buy a reinforced hose 6AN and return 8AN. You can install it for 1 day. All fittings are worth a penny. The cheapest solution for pumps is Walbro on 255 gallons per hour in parallel in the tank. No controllers, let them beating all the time. If you connect through the controller, it probably will fail and cut off everything. You can put two pumps from the American Supra. But, for God’s sake, put the new. This is not a place where you want to skimp. Like it or not, a Koyo radiator or comparable have to be taken. It is at least 30% more productive than native. Another desirable thing is two-part fan controller for a temperature sensor. All this dramatically affects the cooling system. The oil cooler is required. With the thermostat. Grex, Trust, etc. a lot of companies are offering such oil coolers. The oil is heating at once under such engine capacity !!! Once again AT ONCE !!! When reaching the temperature of 110 degrees oil loses its properties and is no longer adequately lubricate the rubbing surfaces. The first thing to suffer is ear. Several hot spots and there will be knock-knock. Do not make something on your opinion in radiator systems. It is better to buy a kit with hoses, fittings, etc. The oil pressure reaches more than 8 bar, and the failure of a hose or fitting leads to instant flight of the oil well and … more obvious. Oil heaters are best to be placed in the bumper or in the wing and it is better to close it with fine mesh from falling rocks, etc. You can buy kits with filter trandfer. Changing the oil in such a car should be done every 3000 km. When tough – use more often. Do the cold inlet. Put boxes wisely with thermal insulation, thermal tape wrap, etc. The least the engine compartment air is heating the inlet, the better. The same goes for the exhaust manifolds. Take on the thermal tape. The colder the engine compartment, the better. It is also necessary to cut the hood on the extraction of air from the inside. If you have an automatic transmission, it is also necessary to cool it. We need one large, or better two radiators in parallel. For manual transmission, if you prefer to have a long anf fast racing periods you need to put the external pumps and oil coolers. Take oil in the beginning of the box, swing through the external electric and give it at the end of the box. This applies both to R154, and a Getrag. Both are prone to overheating and failure of inclusion of transfers in case of overheating. The same applies to the rear gear box, especially if you are driving for long periods at high speeds. Well, and about the intercooler: Trust V-SPL – this is the minimum, R-SPL or three-row luxury coolers even better. It is better to buy a Japanese, even if it’s used but with the resonator to the catalyst and the exhaust pipe (up to the turbines). The issue needs at least 80 mm, better at 85mm. Half-hearted solutions there is no longer held. Requires a full release “to the turbines’ without any inserts from standard components. I advise Apexi N1, VeilSide, HKS SuperDrager. I advise Apexi paper into the standard filter box. In the extreme case Apexi cone. No HKS! The main problem. The cheapest solution – Apexi Power FC with Yahoo. With commander, better if it’s Pro. Such variants slip on Yahoo to $ 500, and sometimes you can find for 200-250$. This full-fledged computer with a card of 20 to 20, is enough to power a detuning. The computer that is very reliable and has boost up card, which can be corrected. That is where to start. But it is mainly for mechanical transmissions. No problem, you can add one more to the wiring connector for a standard computer specifically for the management of the machine. What else is good Apexi Power FC, it’s the fact that he goes directly to the Sets of a pressure sensor and often boosts solenoid that allows you to give up spending on boost controller. Everything is controlled from the commander (remote control), which is placed in the cabin at hand. The second option: Greddy eManage and eManage Ultimate. More expensive and less popular. This is a computer snag. That means it is not complete, and working with a standard computer with cheating. Plus, it needs its own pressure sensor up to 3 bar (120 dollars), cabling (sold separately), the software and a cable to connect to a laptop (optional), wiring for injectors (sold separately). In general, it is more expensive and less reliable solution. Plus eManage a broad coverage of the settings on the forums. The third option, and the most ideal: AEM EMS. This computer is used in 90% cases in the United States. And for good reason. It is possible to customize everything, including automatic, pump control, nitrous, boost, water injection and so on, that is all that can be imagined. Adjust it is more difficult than other computers, but more accurate. 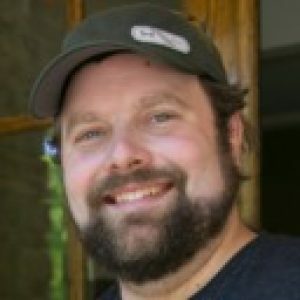 According to it, there is a lot of information, a lot of questions on the forums lit up in the US, the most worthy, but also the most expensive solution. US dollars in 1500. To it is required a pressure sensor (60 dollars) to 3 or 3.5 to 5 bar. It allows you to save not only boost controller, but also a broadband lambda. AEM produces lambda specifically for their computer, their cost is very low (US $ 120) and the lambda is very reliable. Also, you can not buy a full sensor exhaust gas temperature, it is possible to buy a sensor ($ 50) and connect it directly to AEM. It is important that the AEM EMS has excellent nock sensor (knock sensor) and it is very convenient to rebuild the mixture. I do not advise buying stitched computers in Japan under certain nozzles (HKS FCon S and V Pro). Their firmware can not be changed and they are sewn under the high-octane gasoline, turbine incomprehensible AR and the ignition is almost 100% will not fall. That is it, you’ll have a play and unconfigured machine. R154 Mechanic keeps 500-550 hp, for how long – it is another question, but it keeps. Getrag is more expensive solution, but it keeps 1,000 hp and more. It’s certainly the most reliable solution, but also the most expensive. R154 is worth about $ 1,000, Getrag ranges from 2,500 to 3,000 dollars. With Getrag you also need to alter the cardan. As for the automatic transmission: transmission of the 1JZ-GTE barely keeps in stock even boost up. Strengthening its with clutch Raybestos Blue Plates solves the problem of up to 500 hp. One of the most complicated topics in this construction. You can not just buy used ring dampers from Yahoo and rely on their compliance with our realities. It is important to choose the spring under each model dampers and matches your goals. And these goals – to drive on public roads. Therefore, if possible, pick spring rate of not more than 5 at front, back 3-4. They are Tein Type HA, Tein Flex, Ohlins, Bilstein, etc. The simplest solution – is to put Kyb New SR Special with springs Espelir or RS-R. Probably the most important thing. The best decision is to install a brake kit from the Supra TT. 4 piston front, 2 rear. These brakes are very good. In conjunction with WinMax Vrave, Pagid brake pads they will keep your “pony”. The brakes from Supra will fit most of JZ cars. Tires…We recommend Toyo Trampio Vimode and Goodyear Eagle F1.